I haven't learned to knit in the round yet, but I wanted to knit a hat so I devised one made of three rectangles sewn together. It turned out well and friends have asked me to make more. It's simple, using only 2x2 rib stitch, moss stitch and a simple increase (or decrease) so I thought I'd write up the knitting pattern and share it. I'm sure this first attempt at a knitting pattern is going to be pretty awful. Feel free to suggest corrections and improvements. 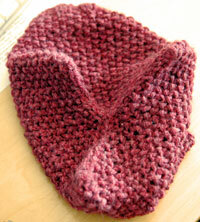 For example, this pattern has no real gauge, but my finished hat is 13 stitches, 22 rows in a 4" swatch. I knit loosely. Cast on 26 stitches*, leaving a 20cm tail. You will need to measure your head to decide where to stop. I did this by holding the rectangle to my head and when it reached from just above my brow to the crown of my head, I cast off. Repeat to make 3 rectangles. Mark the top center point of each rectangle. Using the long tails, stitch the pieces together to form a tube. Bring the marked center points together in the middle and sew the top closed, forming a Y (see photo). If you have extra yarn and want a super-cute hat, sew tassels or pompoms to the points. * For a hat with tighter ribbing, cast on 24 stitches, do the ribbing rows, then increase (make one) instead of k2tog on Row 9. Congratulations! I just adore moss or seed stitch that you use on your hat. You might like to see what I am doing on my site too.